May I just say, I'm immenseley enjoying everybody's introductory tales, and can hardly wait to see all your characters arrive in France! I’m hoping this campaign will be a good chance to brush up on my writing skills, which are a bit ropey at the moment - good thing I have the talents here to learn from! I awoke at 6 O'Clock in the deep, enthralling blue of the early morning, and manoeuvred my way through the rows of dozing pilot trainees, remaining as silent as I possibly could. I had very quickly found out, on my second morning, that the pilot that wakes the others quickly falls out of favour! Daydreaming of returning to France (I have neglected to mention previously that I was posted earlier in the year in the infantry, but Pneumonia scuppered me before I had managed to get near the war), I found my way to the door of the Barracks and, unlatching it, stepped out to a fantastic scene of early-morning fog, like the great wispy ghost of some immense river rolling over the heath. I was one of the few souls awake and moving on the aerodrome, and so took the time to meander around the hangars, conducting my own personal inspections of each machine. In the hangar nearest the barracks rested the training machines, a pair of B.E.2s and one Avro 504. I marvelled at the intricate construction of these surreal new machines - the criss-crossed flying wires, the elegant slope of the propeller, the wooden spars that stretched upwards like slender arms to hold the upper planes aloft...remarkable! The Avro 504 was also a fine-looking machine, although not nearly as pretty as the B.E in my opinion. Unlike the B.E's, however, the Avro had skids protruding out from the sides of the wheels, like tusks, to prevent the uninitiated pilot from 'nosing over', that is to say, flipping the machine forwards, in the case of a rough landing. In some strange way, I felt proud that I had undergone my first 'solo' without incident, or need for the skids, for only yesterday one of my fellow trainee pilots, a frighteningly young 2nd. Lieutenant named Rowan Turner, had all but buckled the rightmost skid when he came in at slightly too steep an angle to land on his 5th trip around the heath. My, did he receive a roasting from Andrews! That was, of course, before the rain begun to spit down at us, and all further flights were cancelled by Cpt. Andrews for fear of a storm. I snapped out of my admiration for the B.E, and slunk out of the first hangar. The next hangar along housed several other B.E's, which belonged to No. 15 Squadron R.F.C. I took a peek inside to see a rigger tirelessly inspecting each inch of canvas across the skeleton of the machine. He briefly looked up at me, grunted in acknowledgement, and went back to his work. Pulling my head back out of the entryway, I pulled out my pack of cigarettes, removing one and reaching for my matchbook. The rebellious match I'd chosen struck out the first two times, but the third time the flame held fast, and I inhaled deeply. Blowing smoke out into the cold air, I strolled over to the third, and final, hangar. I peered inside to examine the machines, and was met with a sight that immediately made me grin with anticipation. Inside the hangar lay an assortment of Vickers”Gunbuses”, and the newer single-seat Bristol Scout machines. With the split of daybreak (the sun had begun to creep over the horizon now, casting the Heath in gold) that flooded in through the crack, I could see the foreboding black shapes of Lewis Guns, white reflections gleaming on their barrels and ammunition drums, and I suddenly fancied that I was already in France, tangling each day with the dreaded Hun! I had not realised at the time, but these were the machines of No. 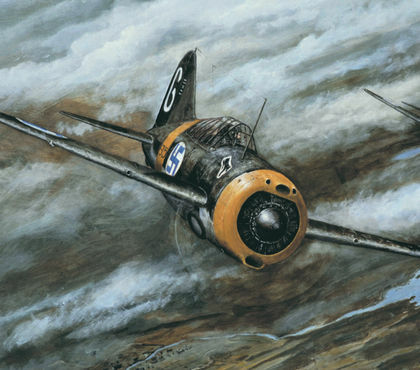 24 Squadron, headed by the famous Victoria Cross winner Lanoe Hawker. If only I had realised sooner, it should have been a wealth of invaluable information to speak to him - one of the most experienced pilots in all the R.F.C! Having concluded my inspection, I made back for the mess hall. As I did, I saw two Corporals quietly grumbling to one another while wheeling the Avro out onto the still-wet grass, beads of moisture clinging to the tyres and giving them a brilliant shine. As I passed, I offered an eager 'Good Morning!' to the two Corporals, who nodded in response. "Bloody cold morning..." I thought I heard one mutter to himself. Out ahead of me I saw Lt. Webb, another trainee, practically bound out of the barracks and come jauntily over to me. Webb was another terribly young lad, of only sixteen, and had been paid into our merry band of trainees by his aristocratic father, who had many friends within the British Army, Colonels and the like. Upon telling his father he wished to fly, Webb immediately transferred from school into the training regime. His indefatigable excitement, of course, came from the fact that he was to fly his first solo today. "Campbell! Fine morning, isn't it?" he asked me, in a chirpy tone. I regarded his face, youthful, feminine, and markedly harmless. I wondered how this young lad was ever supposed to fight a war at his age, but such questions are for the men in the recruiting offices, and not my concern. "Aye, fine morning..." I replied, and Webb beamed, before looking hungrily at the Avro, now left alone by the Corporals to sit patiently on the airfield, awaiting its master. "I'm 'going up' today! Would you believe it!" he continued, still affixed on the Avro. The answer, of course, was that I could believe it, with us being trainee R.F.C. pilots at an aerodrome, but for politeness' sake I shook my head. "No, it's quite something! Good luck!". Webb was about to press his emphatic offensive when Cpt. Andrews appeared on the field, beckoning the rookie pilot over. "Ah, here I go!" he said, to nobody in particular, and skipped off to answer the Captain's summons. I took the chance to return to the Barracks in order to write my diary. I told the blank pages of the stunning beauty of the early-morning Heath, to the muffled sound of the Avro starting up, before heading to the mess to have my breakfast, eggs and bacon and a bowl of porridge afterwards. Heartily fed, I headed back outside to watch the young Webb flying his circuit. Shakily he drifted through the sky, and was halfway round the aerodrome when suddenly his engine sputtered, missed, and cut out completely. A deafening silence hung in the air, as I felt a surge of fear for the lad. In my head, I repeated the cardinal rule outlined to me by every instructor I had crossed paths with: "Don't turn back! Glide forwards and look for a good landing spot!". Fortunately, the Heath had several flat, grassy fields for the youngster to put down in, but almost as if to spite my recollection I watched in mute horror as the Avro dipped its Starboard wings and attempted to loop round for the aerodrome. The plane wobbled and shuddered, its nose dropping, and for one agonising second I thought the machine would spin, but it thankfully snapped back into a dive, and came down in a curve towards the airfield. The landing angle wasn't quite right, however, and the skids buckled, jolting the nose of the aircraft into the ground with a sickening force. 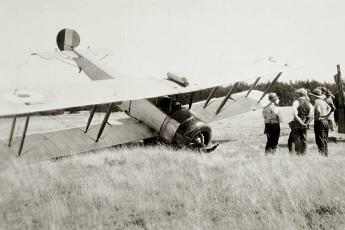 The undercarriage collapsed upwards with the skids, and the aeroplane lay on its nose with its tail pointed in the air. I watched a truck, loaded with several corporals & medics, assembled in the blink of an eye by Andrews, speeding towards the wreckage and pulling the frail young lad out. To my great relief, he was only dazed with a mild concussion, but he looked so terribly shaken, and as pale as a sheet as he was checked over by the ground crew. From my observation point I heard Andrews roaring enraged questions at the poor boy, before he was promptly whisked away. Last edited by Wulfe; 12/03/18 10:57 PM. Papers arrived today. Amazing that the RFC bureaucracy actually tracked me to Glasgow on leave. Maybe things at Castle Bromwich have gotten a bit more organized since I left two weeks ago (not likely!). Anyway, it's official ... Second Lieutenant Aleck Allen MacKinlay! And to top it off, I have been assigned to active duty. Will have to cut short my visit with Mother and Father and head south immediately. Required to appear in France before the end of the month; seems like plenty of time if all goes well. Thanks to Father I have all the kit I need and can head out directly. Will pack up this evening and say my goodbyes in the morning. What a great bunch of stories! Wulfe, good description of Graham's first flight in a BE. Fullofit, I really enjoyed Gaston's backstory. That postcard of the gate at RGA Le Bourget was a great touch. Carrick, best of luck with Nigel. Stay out of the trees! Loftyc, good job getting through the touch and gos. Lederhosen, you had me reading up on Melli Beese. Fascinating bit of research and period colour. And I really loved the photo of the takeoff from Freiburg in your second installment. 77Scout, here's tae the wee Glaswegian! Lou, the hometown paper clipping was an inspired touch, as was the RFC letterhead. Sounds like the boys had a great outing in the rain at Stonehenge and in Salisbury. I'll pick up Jim's story tomorrow night as I forgot to go into workshop settings and "Log all," so I'll be redoing the first flight from Netheravon then. Really great Start up stories everyone. Wulfe, another excellent read, most evocative storytelling. You needn't concern yourself about your writing skills as they are not remotely ropey - well done. Scout, good to see that Aleck's papers came through. He'll beat us all to France! Raine, thanks, I rather liked the newspaper clipping myself, but then I am biased. Seriously though, I am finding it a fair bit tricky to actually dial back my usual writing style when it comes to these reports. I'd gotten myself so locked into the British mindset with old Arty that I have to stay mindful he doesn't creep back in when I am creating the episodes for Swany. I should actually have a much easier go of it this time as I can use my own voice, more or less, seeing as how I've grown up in Minnesota and have many Norwegian relatives, several of whom live up in Warroad and Roseau. Speaking of Swany, despite being up late last night he still arose bright and early and was out on the aerodrome shortly after five to see what the weather was looking like. No wind at that point and only a hint of intermittent rain. He is hopeful that come sunrise he will be able to get a flight in on the B.E.2. Keep the stories coming folks, they are really making my morning coffee that much sweeter. My pilot will begin his career in January, so I will post his first entry a bit later this month. Last night, after I had returned to the Barracks, several of the trainees had gathered around and were feverishly discussing Webb's Avro crash. Lt. Weston (whom you may remember was the unfortunate chap who witnessed a mechanic being killed in a prop-spinning accident) called me over excitedly, mentioning to the small gaggle of recruits that I had seen the whole incident firsthand. "Go on, Graham, tell us what happened!" he urged, as the other men seemed to draw a collective anticipating breath. I looked them over, shocked that they should be so curious about a crash when many were yet to fly their first solo, but, I thought it best not to keep my impromptu audience in suspense. "Well, you see, he was doing his first turn around the aerodrome, he'd gotten up in the air with no issue, but about halfway round I heard his engine miss, and the silly bugger tried to turn back. In the blink of an eye he was tipped over on his nose, on the ground". An uncomfortable silence followed my explanation, followed by Weston matter-of-factly blurting out "well, Andrews has told us enough not to turn back, it's the lad's own bloody fault!". It rather seemed to me like he was trying to bolster his own courage; perhaps the crash had left the men shaken after all. After a short half-hearted discussion about Webb's condition (the poor old Avro got not a single mention!) I was offered to join the men in a game of cards, which I politely declined. By that point in the night, I still hadn't fully recovered from the shock of seeing Webb come down. Anyway. That was yesterday, and today was a new day. I awoke around 7 O'Clock, feeling surprisingly well-rested, and slowly pulled my uniform on. I was in no spectacular rush to get myself prepared for the day, as I already knew that I was not scheduled to do any flying. Instead, I rather fancied asking Andrews if I could make a quick excursion to London, to experience some of the charms of the Capital. Perhaps even a trip to Hendon aerodrome, to see the wide range of machines they had there! It was at Hendon that I'd seen my first aeroplane fly, which had inspired me to pursue a transfer to the R.F.C. Once I was ready, I made my way through the bunks and idle pilots towards the door. Curiously, I passed one bunk that had been freshly-made already, and had no kit resting on the floor beside it. I was sure I had seen that bunk occupied when I had arrived! Glancing strangely at the absent bunk, I continued outside and made for my cigarettes. It was only as I was lighting up that I realised, my, that's Webb's bunk! The poor lad must have been scared right off of flying for good. Who could blame him, after all? As I smoked, I saw two 'pusher' machines coming in to land. At first I thought that they were two of No. 24's Gunbuses, but as they drew closer I could see that they were a new single-seater type that I didn't recognise. The two machines glided in, blipping their engines as they levelled out, and both made beautifully smooth landings. As they taxied towards the hangars, I noticed that each machine had a Lewis gun mounted in the pilots' forward nacelle. Single-seaters with machine-guns! Unfortunately, I never did manage to get away to London for the day. Instead, I marvelled over the new machines. They belonged to No. 24, and a short chat with one of their pilots revealed that they were called "D.H.2s", and were supposed to be the answer to the Fokker monoplane menace. Gosh, I do hope I'm put in one of those when I get to France! In the evening I was approached by one other trainee, 2nd. Lt. Jack Fisher. The man had a drunken look about him, red-faced and perpetually smiling. I assumed he would ask me about the Avro Crash, but it came as a pleasant surprise when he asked me in a chirpy, musical voice about my opinion on the B.E.2. I told him, and our chat led elsewhere. I swapped him stories of my time in the Sherwood Foresters, my first initial day in France and my unfortunate case of Pneumonia, and he paid me off in tales of his time as a Concert Pianist, before the war, playing to various Aristocrats, and even Royalty in some cases! I soon discovered that Fisher and I got along near-instantly, and felt quite good about having formed the makings of my first friendship at Hounslow as I retired for the evening. Last edited by Wulfe; 12/04/18 11:56 PM. Awesome stories everyone. It looks like this challenge kicked it up a few notches. The ideas are just flowing and the excitement is growing, even though we're not even describing combat yet! I'm so impressed. Well, the first 2 days were uneventful. All flights were grounded due to rain and strong winds. There was still plenty to do on the ground and the students were kept busy. It also gave me the chance to write a letter to Violette and the kids. Unfortunately, this lull made it possible for me to also finish my weekly wine rations prematurely. The next day, when it came to my turn at the controls, I felt uneasy on an “empty stomach” and the 5 take-offs and landings exercise took more effort and concentration than I expected. The heavy clouds in the sky reflected my disposition. Today the weather remains as foul as yesterday and the second set of take offs and landings triggered the feeling of déjà vu. Despite all this negativity the exercise went smoothly until the fifth and final take-off. Once clear of the aerodrome the rain started to come down in buckets. The visibility was close to null. I’ve managed to make a circuit and lined up for landing when the rain let up and the visibility returned to acceptable levels. I was just about to curse Toutatis and Belenos for playing a trick on me, when a column of army trucks appeared in front of my flight path, right at the edge of the landing field. My eyes grew to the size of saucers and my hands gripped the control column and pulled so hard that I thought I’m going to break it. The bird begun to slowly gain altitude through my sheer will alone and barely cleared the line of trucks before setting down on the wet grass of the aerodrome’s field. I realized I was still holding my breath. I started to giggle. If I had some wine left I would offer it to the gods. It was then that I realized that this flying business isn’t going to be as easy as I thought. Good stuff, Wulfe and Fullofit. You have me looking things up all the time, like refreshing my memory of Toutatis (dim recollection of Asterisk the Gaul swearing "By Toutatis"). Inspired by Lou's latest, here is the third installment of Jim Collins's memoirs. By the way, how is the Caudron? I bet it's fun to fly. I noted that Gaston Caudron died in December 1915, the 4th if I recall. Don't do like him! Part Three: In which I am introduced to a Guardsman and a real war pilot, purloin a vehicle, visit a Druid site, and acquire culture, undergarments, and a surfeit of beer. He said his name was Sergeant-Major Brookings, and he took a roll call and formed us for inspection right on the roadway. A young captain appeared and the sergeant-major snapped off a salute and marched off with guardsman’s precision (we later learned he was seconded to the RFC from the Grenadier Guards). The captain introduced himself as Captain Hampton-Lewis and proceeded to assign us our instructors. We were to get our kit sorted out in our assigned huts and report to the Officers’ Mess to meet them in a half-hour. Swany and I were assigned to a hut with a fellow named O’Brien who was nearly done his training and was awaiting his coveted wings. The fourth bed in the hut was vacant except for a trunk. Its occupant had crashed on takeoff the previous day and was to be buried that afternoon. The mess was a nice surprise, a fine two-storey building with comfortable furniture, a piano, several good writing tables with stationery aplenty, a bar, and a lovely warm fire. Major Ganbert, the OC, welcomed us newcomers and I met my instructor, Lieutenant Thomas. He had recently returned from France where he had served with No 1 Squadron since the start of the war. Since Swaney had disappeared with his instructor, I visited the hangars on the field, which was a few hundred yards east of the camp. The wind was blowing thirty knots and the rain fell in sheets. Flying was out of the question. I plodded back to the mess and caught up with my letter-writing. Swaney appeared shortly after and informed me that most of the pilots here were billeted outside the camp, so it was relatively easy to get permission to leave the area. In fact, he’d already discovered that the OC had access to a fine touring car and he suggested I persuade him to part with it for the afternoon. I thought in highly impertinent to ask, but had the good fortune to see the Major come into the mess for a cup of tea. Not having yet met the adjutant I approached the OC and asked how one could arrange a few hours’ leave from the camp to pick up some tea and incidentals for our hut. Swaney whistled and mouthed the word #%&*$#. “It’s amazing what a little money can do, Jim,” he said. We made a fine day of it, driving a few miles south to see the famous stone circle of Stonehenge. We remarked on the massive amount of work the thing required and wondered why on earth it would have been built. I suggested that some Druid version of Sergeant-Major Brookings had found some warriors has misapplied their blue woad and set this thing up as punishment duty. We headed into Salisbury. We’d caught only glimpse of it this morning and it looked like a fine place. We were not disappointed. We toured the cathedral and saw the Magna Carta. Then Swaney told me that another pilot at the camp had told him of a bootmaker and military provisioner in town and he wanted new boots. The boots were so impressive that I ordered myself a pair as well, plus a fine set of long woolen underwear for flying. 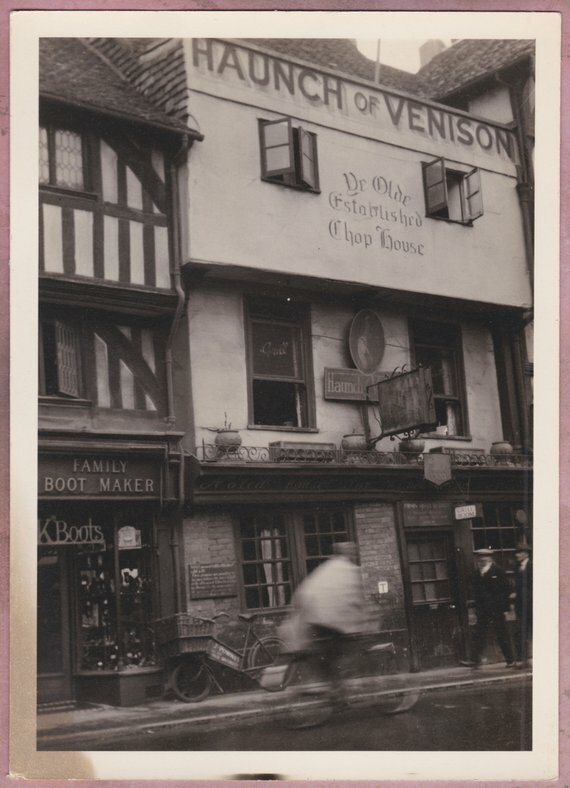 Our parcels in hand, we headed next door to a storybook inn called the Haunch of Venison. Since Swaney was paying for dinner, I told him to find a place by the fire and I would get us a couple of pints of good bitter. "Our parcels in hand, we headed next door to a storybook inn called the Haunch of Venison." Dinner was the finest meal I’d had in England to date, and afterwards the place filled up with some RFC types, including several from 20 Squadron, which was working up on the fine new FE2 two-seaters. More ale was downed while we discussed the merits of different aircraft. The consensus was that the BE2 was unlikely to kill you unless you met the Hun, and then you were dead. The FE2 was superb. The little DH2 pusher scout was lovely to fly until it spun. You couldn’t get out of a spin in one, so you were dead. The Morane was to be avoided at all costs. It would kill you on takeoff, or spin, or kill you on landing. You would be too busy to worry about Hun machines. I was in no shape so Swaney drove us home. He drove faster than I’d have wanted, but he told me that drunks really shouldn’t be on the road for long so he had to hurry. The next day it rained again and I took ground instruction on the BE2. Unlike the Farman it has a unified control called a joystick. The training machines were all rather tired and did not give full power, but Mr. Thomas assured me it would be quicker off the mark than anything I’d flown to date. 3 December 1915 dawned drizzly and wet, but the wind had died and Thomas told me I was going up to do circuits and landings. He went over the instructions one last time and I nervously atammered through the starting procedure, waved away the mechanics, and trundled out to the east end of the field. I said a quick prayer and opened the throttle fully. The Renault engine roared and the machine bumped over the wet grass. In a few seconds the bumps stopped and, without my really noticing it, the BE2 climbed easily into the grey sky. It was wonderfully stable. I leaned over to check my height compared to the slight rise and row of trees at the far end of the field. Rain stung my face like needles. I hunched behind the triplex windscreen and adjusted the mixture. At a thousand feet I began a turn to the right. Although the wind was negligible at ground level, at this height it buffeted the machine and I kept the throttle fully open. Coming around to land I throttled back to idle and adjusted the mixture again. The machine skimmed the treetops. Ahead loomed a telephone or telegraph wire. I opened up and staggered over it at the edge of a stall, and then nosed down and throttled back, just skimming over the crest of a low hill by a farm at the east side of the field. I wallowed in and touched down. "In a few seconds the bumps stopped and, without my really noticing it, the BE2 climbed easily into the grey sky." The next day we saw the sun for a few minutes and I got in my five circuits again. This time I set myself a goal to land slowly enough that I would not pass a small building halfway down the field. I succeeded on four out of five tries. It was absolutely topping to be flying a true war machine at last! Another fine trio of tales added to the fledgling collection. Wulfe, some people just want all the bloody details when it comes to crashes, I never quite understood why. Fullofit, I am quite green about Gaston getting to fly the Caudron, the lucky buggar. Raine, great stuff, and where did you find that excellent old photo of the pub, it's precisely what I'd been looking for. Swany did manage to get a circuit in yesterday morning but it was cut short as the engine conked on his B.E.2 when coming in for his fourth touch. But it did give him some practice making a dead stick landing, which he pulled off without incident - thankfully. He's hoping to get his full time in today, provided the weather doesn't have other plans. Lou, somehow I doubt they would use state of the art machines like the G.4 to learn to fly, but hey - they’re French! And I agree, Gaston lucked out. Raine, I was hoping someone would get the reference from Asterix. I don’t think they still celebrate these older gods. The Caudron is surprisingly agile for something that barely fits into a hangar. Gaston is confident he will be able to keep up with the Eindeckers, but it’s the wine talking. He’s only completed 2 flight training missions after all. The only negative about this bird is the forward visibility. Good thing there is a mitraillieur in front to let him know what’s ahead and, of course, to shoot down the dastardly Boche. Having the flown the Caudron in a French career, I can say it's more than capable of defending itself in 1916, and handles pretty nicely too. Last edited by Hasse; 12/05/18 12:27 PM. Thanks Hasse, that makes Gaston breathe easy. Having flown German career, Aldi Schwarzkopf found Caudrons to be an easy prey. I suppose it all depends on who is at the controls. Hugo Lane is missing, and one of our training B.E's has vanished with him. As per Andrews' instruction, he was to fly to Beaulieu, land, and return. However, after three hours of impatient waiting, Andrews finally telephoned the Adjutant's office there, only to find out that Lane (and, more importantly in Andrews eyes, the B.E.2!) had never arrived. The ever-optimistic Fisher reckons he simply had some kind of mechanical failure, and put down en route, and assures us all that Lane will make a reappearance by the end of the night. Weston thinks he's gotten lost, and ended up in some farmer's field. I could believe either of them readily enough! It is, for now, a mystery. We still have one B.E.2 left, and I am scheduled to go up in it shortly. Andrews wants me to stay up for a full fifteen minutes this time, and complete a wide circuit of the Heath. Although I shall only be up for less than an hour, I am very well braced, for it shall be the longest individual stint I've spent in the air to date! that being said, the weather was markedly less favourable than my first two trips into the sky - there was a fairly strong wind coming in from the South, and above the airfield a large flock of Seagulls circled and cried out. As my father had taught me, seagulls this far in-land meant that a storm was imminent. On the grass outside the barracks sat Weston and I, switching our attention between watching the wheeling birds and scanning the skies for a sign of either of our B.E.2s. By the way - our remaining accounted-for machine, in which I was scheduled to fly, was currently up somewhere in the air nearby, being flown by 2nd. Lt. Freddy Foster, our resident Kiwi. Freddy was, by no doubt, one of the most interesting chaps in the trainee's barracks. Allow me to explain. Not only had Freddy been a relatively well-known Boxing champion in Nelson, a town on the Northern coast of New Zealand, but he had also landed with the ANZACs on Galipoli, as a Sergeant, in May. Only four days after the landing at Helles, he was twice wounded, in the left knee and hip, by machine-gun fire, which led to him having a severe limp. He was invalided back to New Zealand soon after, but, refusing to let his injuries deprive him of serving the Empire, travelled to England, and the Flying Corps, to continue his war on grounds that accommodated his debilities. His image seemed to match his history. 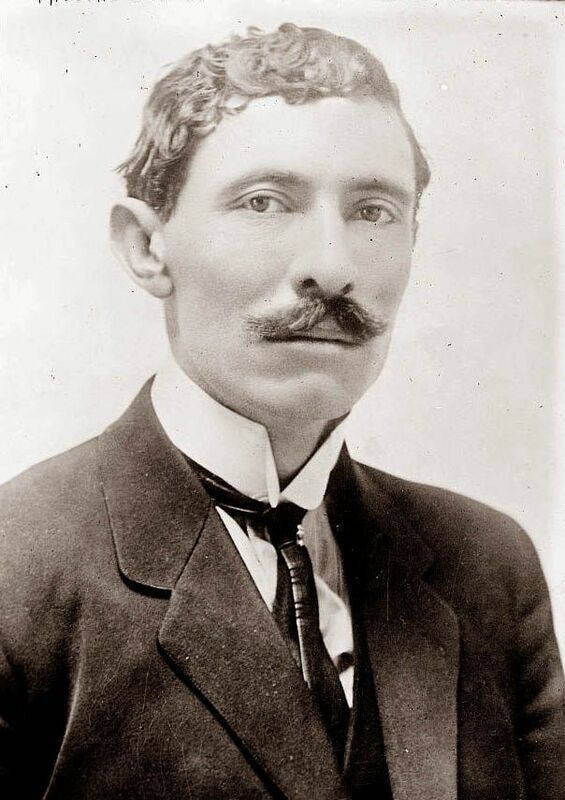 Cresting sharply-defined cheekbones and a squared-off jawline, his slightly curling dark hair was cut in a practical short back-and-sides, combined with a thick moustache, parted in the middle, curling upwards and away from the corners of his mouth, gave him an impossibly stern appearance. Above his curling moustache and slightly-flattened nose sat two piercing blue eyes, which seemed to stare through you as you spoke. In fact, they seemed to stare through the landscape, into some deeply hidden memory. Naturally, we all expected this dangerous-looking Colonial to throw his weight around from the onset, and bully us all around. Imagine our surprise when we discovered that, in actuality, Freddy was as delightful as you'd like, a real top fellow! He'd always offer his own time on the B.E. to the pupils in need of extra flight hours, and was always first to help out a fellow in need. On top of that, he had a wicked humour, and would often do an impression of Cpt. Andrews in the evening that would have us rolling in fits of laughter! 'The Hounslow Hellhound', he called the act. It was only after we had learned of Freddy's true nature that we begun to notice, hidden behind the battered boxer's features, the laugh-lines around his eyes and mouth. We simply could not fathom that a seemingly born-fighter would be so jovial! Anyway, I don't mean to ramble on. By any means, here came Freddy now, elegantly touching down in our remaining B.E, before taxiing to face West again and dismounting the machine. From underneath his scarf and helmet appeared his beaming face, red with cold, and he shouted across the airfield to me "She's all yours, mate! Ethan's got her running like a dream!". Cpl. Ethan Knight was the engine fitter for our B.E's, and took the care of our machines very personally. I smiled back, and thanked him from afar, as I pulled my own flying coat on. I made for the B.E, but was intercepted by Andrews, who had yet again appeared from thin-air as I've known only R.F.C instructors to do. "Campbell. Fifteen minutes' flying around the area. Don't take her above 3,000 feet, and remember! If your engine misses, don't you dare turn back!". I nodded solemnly, but the memory of Wyatt's close call was all the reminding I needed. I clambered into the B.E, as one of the mechanics jogged over to my nose, grabbing the prop and beginning to twist it. "Switch on!" came the call. I fingered the magnetos upwards, and repeated the phrase. In response, the mechanic cried "Contact! ", and I was instantly wrapped in the pleasant vibrations of the engine. Once the mechanic and the Captain had stepped clear, I confidently pushed the throttle lever forwards, and the machine answered eagerly, and in a few seconds we were airborne. At first I was slightly un-nerved by the way the wind was buffeting me about, but I had soon eased to the sensation and was enjoying the thrilling roar of the wind as I climbed, banking gently North, towards London. I followed the great winding Thames river until I reached the Capital. Of course, I had visited London twice before, but from this elevated point I was amazed by the size of the city. By the time I was crossing over the top of Hendon, I had reached 2,000 feet. Below me, I watched in delight as an Avro stunted close to the ground. Peering over the side of my cockpit, I almost forgot that I was piloting a machine myself, but this was soon made apparent to me again as a particularly harsh gust of wind knocked me almost onto my side! Alarmed, I righted the machine and vowed not to shun her again. Although I was thoroughly enjoying my view from the edge of London, I had to make sure that I didn't lose sight of the aerodrome, as I had no map, and so I turned the B.E. South, crossing on the other side of the Heath towards Esher, and the stunning lakes beyond them. Feeling exhilarated, I almost considered stunting over the water, but I feared that the omnipresent Andrews may catch me! The thought of the Captain reminded me that I was to be back in fifteen minutes, and I had been up for just over twelve now. Reluctantly, I came back down (having reached 2,800 ft in total) and turned back for Hounslow. When I arrived, Lane had returned with his own B.E. As Weston had predicted, he'd gotten himself lost on the trip. Incidentally, this led to Weston winning a wager with Fisher. It also led to an almighty chewing-out of Lane by Cpt. Andrews! Last edited by Wulfe; 12/05/18 11:53 PM. Now THAT was an immersive episode. Very nicely done! Wet, Slushiness and generally bad weather. Stayed inside after helping the Riggers had all Flying machines covered. Last edited by carrick58; 12/06/18 02:46 AM. Was not able to get train tickets on short notice so ended up staying in Glasgow an extra day. Worked out marvelously as I was able to head over to the University and see some of my Profs and classmates and say farewell. Father is still a bit upset that I won't be finishing my final year of engineering, but he has mostly come around and now actually seems proud to see me doing my part for the war. Funny, I really have the old man to thank for my wings; if he hadn't been working with Richard Barnwell at the Clyde Shipworks I never would have had a chance to get in touch with his son Harold Barnwell. What luck to have Harold usher me right into the Vickers Flying School this summer. Thank God for 'connections' or I would likely be heading off to some muddy trench rather than a pilot's barricks (they will have barricks I hope, not bloody tents). Said my farewells to Mother and Father this morning. Mother was quite upset. I hate these emotional goodbyes and tried to assure her I would keep myself safe and be back home before she knows it. Father even seemed a bit teary, which shocked me a bit. Never seen that from him before. Got a cab to Glasgow Central Station, and had a gloomy cold train trip along the West Coast Main Line to Birmingham. The weather was dreadful and wet but the trip was uneventful. I could have made it to London in a day but decided to stop off and see the lads at No. 5 Training Squadron; I have a few days to spare. Was able to hop a ride on an army lorrie that was heading east and arrived at Castle Bromwich in time for evening mess. Even though I have only left two weeks ago, there are lots of new faces. I wonder if the new sods have figured out yet that half the instructors at good old 'Number 5' don't know their arse from a cylinder bore. Oh well, I made it through alive, so I guess most of the others will too. Had drinks and good cheer with several of the lads; Squiffy, Nelson, Harrison, that bunch. After a rather bad sleep on a spare cot, I had breakfast with the lads, then caught a car ride back into Birmingham. Soon back on the train towards London and within a few hours I was milling about with a huge crowd in the Great Hall at Euston Station. Have made arrangements to stay with Aunty Glenise at her townhouse in West Kensington for a few days while I sort out my transport to France. I would have walked there had it been nicer weather (not too far from the station), but it was raining like the devil so splurged on a cab. Aunty was thrilled to see me, making quite a fuss over my new uniform, and had a splendid hot meal and tea for me in short order. Happy to settle into a proper bed again in her spare room. Thanks, Raine! Glad you enjoyed it! We were all jolted out of our sleep this morning by a terrific thunderclap right over the top of the Barracks. We blearily looked around at each other, all half-sat up in our bunks, through the low visibility of morning. Listening to the wind howling through the building, and the rain savagely beating at the roof, I watched in amazement as Freddy, three bunks forwards of mines, promptly laughed, lay back down and went to sleep again. There were several more thunderclaps, but the stubborn Kiwi refused to be roused by them. I suppose that he was somewhat used to sleeping through such a percussive din. About half-an-hour after we had all finally fallen out of our bunks (again, except for Freddy), the door swung open with an almighty crash, to reveal a drenched Corporal who regarded us all with a hateful eye. "By order of Cpt. Instructor Andrews, there shall be no flying today". He bawled. "Whyever not?" Weston called back, and we all chuckled. The dripping Corporal growled under his breath, and promptly stepped backwards out into the storm, hunching himself over in a vain attempt to keep from becoming further drenched, and the door swung shut once more. A few of the more resilient lads decided to try and get a hold of a car to take a trip into London, but the majority of us were content to laze around the Barracks, writing letters home, playing cards, and otherwise keeping ourselves entertained. The day seemed to drag on at a snail's pace, with the constant howl of the wind and beating of the rain slowly fading into the background of our conscious thought. When we reluctantly headed to the mess, all of us at once, a small group of pilots, including Weston, had the barmy notion of throwing a bedsheet over their heads to keep dry. I only feel sorry for the chap who will have no sheets to sleep under tonight! We had again the breakfast of Bacon and Eggs, which in all honesty had become somewhat tiresome, and decided to stay put in the mess rather than braving the weather once more to return to our quarters. Outside the window I could see that the seagulls were gone, having issued their warning the day before. As I looked up into the dull sky, a flash of white caught my eye on the airfield and, looking down, I was amazed to see a B.E, tilted on one wing, sliding along the aerodrome with two mechanics in tow, before finally tilting completely on to its back! Desperately the two mechanics fought to tether the rogue machine down, and I (now joined by several others) cheered them on from our vantage point, finding the whole spectacle to be incredibly amusing. To nobody's surprise, before long Freddy's shape appeared on the field, bounding over to help the two poor mechanics, and with his help they had soon tethered down the waterlogged aeroplane. The rest of the day past just as slowly as the first half had done, and we soon became bored with our newspapers, cards, and unsavoury stories about encounters with young ladies back home. When it was finally time to turn in for the night, we all crowded out of the safety of the mess, being blasted one last time by the storm, before gratefully sinking down to sleep, to put this most boring day behind us. Some of the bunks were still empty, and so I assumed that our pals had made it out to London after all, and were currently still in the middle of a binge. Last edited by Wulfe; 12/06/18 09:04 AM. This is great, my morning coffee time just keeps getting better! Wulfe, more excellent storytelling. As noted by Raine, very immersive stuff. Scout, well done. I do hope Aleck will take advantage of his time in London, especially during the holiday season. Carrick, bad weather has been the curse for a lot of folks here. Hopefully Nigel will get some flying in today. 2nd Lt. Swanson was an early riser, the chores given him while growing up on the family farm along the Minnesota-Canada border had seen to that, despite what his personal preference concerning sleep schedules may have been. It was habit now, and one he had come to appreciate. He dressed quietly but quickly and slipped out of the hut without waking Collins or O’Brien. Heavy dew embraced the grass and trees but the air was clear. A rosy glow illuminated the eastern horizon and lit up the underside of the low wispy clouds that dotted the sky. And there was no wind, at least not at the moment. It would soon prove itself to be a wonderful morning for flying. For now though, Swany simply enjoyed having this quiet time as his own. He walked towards the flying field, removing his maternity tunic as he did so, and as he passed the camp flagpole he hung it on the halyard cleat. He rolled up the sleeves of his Greyback shirt and began to jog, out along the edge of the field, upwind, past the collection of small hangars and sheds that stood there. He made the first turn and continued across the near end of the field, he could already feel the dew soaking into his stockings along the top edge of his shoes and was wishing he'd gone to the trouble of doing up his puttees. No matter, the exercise felt good and he needed it, truth be told he craved it. Years of strenuous physical labor and activity made it so. He undid his collar button as he rounded the second turn and continued along the far edge of the field. The sun was just about to crest and the trees and buildings began casting long, murky shadows. They reminded Swany of certain early mornings back home when he would be out tending to the cows – or hunting ducks and geese, crouched in a stand of reeds, shotgun at the ready – or having a cup of coffee with his uncle as they prepared for a day of tree felling or milling – or out checking the traplines, hoping for some good pelts that would add more coins to his flying fund. Always busy, always something to be done. The downwind end of the field had been reached and Swany made the third turn. A sliver of sun now blazed on the horizon. It was a marvelous sight after so many days of rain and gloom. He hoped it would last and allow him and his fellow pilots-in-training a chance at some extended flying. For as far back as he could recall he loved being up above the ground, and began climbing trees at an age far younger than approved of by his parents. He had no fear of heights whatsoever and when Swany turned fifteen his uncle took advantage of this fact by sending him up to top off and limb pine trees before they were felled. The young man adored the task as it gave him the view of the world he craved – the view from above. Kakaygeesick, the chief of the local Chippewa tribe that, for centuries, had inhabited the land which Swany’s family now called home, once told him that he had likely been a bird at one time and that this was why he was always longing to get up into the sky. When the elder heard that Swany would be going off to fly aeroplanes he smiled and said, “animwewebizo”, which was to mean, “he flies away with noise”. Soon others in the tribe, upon seeing Swany in town or along the road, began calling out the same thing. It made him laugh just thinking about it. “I’ll take that bet, but first I need something warm to drink and a bite to eat. You coming?”, 2nd Lt. Collins cheerily replied. The two headed off in different directions, but would soon be sharing a quick breakfast and, with a bit of luck, a good day of flying.